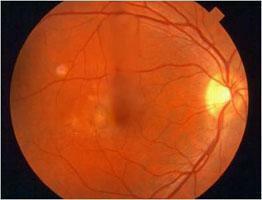 The visual symptoms of AMD involve loss of central vision. While peripheral (side) vision is unaffected, one loses the sharp, straight-ahead vision necessary for driving, reading, recognizing faces, and looking at detail. 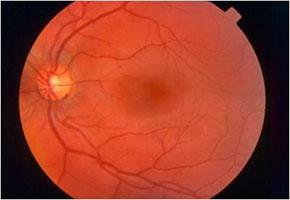 Although the specific cause is unknown, AMD seems to be part of aging. While age is the most significant risk factor for developing AMD, other identified risk factors include heredity, blue eyes, high blood pressure, cardiovascular disease, and smoking. AMD accounts for 90% of new legal blindness in the U.S.
Nine out of 10 people who have AMD have the dry form (called atrophic), which results in thinning of the macula. Dry AMD takes many years to develop. 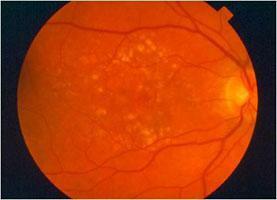 Currently, there is no treatment for this form of AMD. The wet form of AMD (called exudative) is less common (occurring in one out of 10 people with AMD), but is more serious. In the wet form of AMD, abnormal blood vessels may grow in a layer beneath the retina, leaking fluid and blood and creating distortion or a large blind spot in the center of your vision. 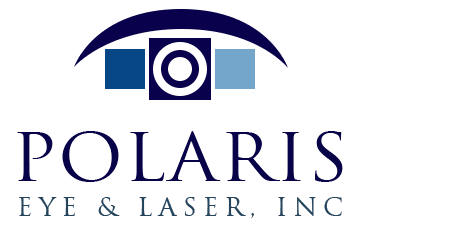 Treating the wet form of macular degeneration may involve the use of anti-VEGF treatment, thermal laser treatment or photodynamic therapy (PDT). 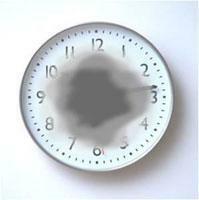 Treatment of wet macular degeneration generally reduces—but does not eliminate-- the risk of severe vision loss. Promising AMD research is being done on many fronts. In the meantime, high-intensity reading lamps, magnifiers, and other low-vision aids help people with AMD make the most of their remaining vision.